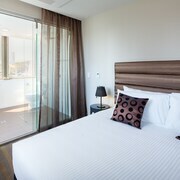 Good hotel with pleasant facilities. However I have been trying to get hold of a person since leaving as my elderly mother thinks she left some valuable jewellery items there. Hotel has been impossible to get hold of which has left me feeling very angry. The staff were very attentive & kind, traveling as a solo mum this makes life easier. Perfect place. Clean, friendly and close to Central. 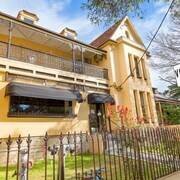 Great staff, well appointed, ideal Surry Hills location. Nice, clean hotel with lots of character. A good experience. Great meal and lovely atmosphere in the beer garden. Only complaint is that we were awakened several times during the early hours of the morning by very noisy females in the corridor. 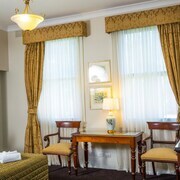 good location, friendly staff, good location close to bus routes and train, a 30 min walk down to circular quay. i stayed in an 8 bed dorm which was really large. staff are friendly. kitchen was undergoing refurbishment when i was there but they were very considerate with signage and warning. Nothing like the photos. I got two beds pretty much touching each other that I had to squeeze through to get into, a really old table and fridge, and paper thin walls. Need some time away from spreadsheets, KPIs and your overbearing boss? Situated 2 kilometres away from downtown Sydney, Surry Hills is a fantastic place to base yourself while exploring New South Wales' impressive capital. Start making amazing memories (and taking some brag-worthy selfies) at Bondi Beach, Sydney Opera House and Sydney Harbour Bridge, just some of Sydney's landmark sights. On a summery afternoon, there's nothing finer than winding down in Steyne Park. 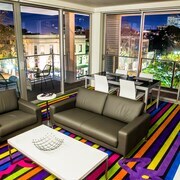 If you're on the lookout for somewhere to stay close by, the ADGE Boutique Apartment Hotel and Adina Apartment Hotel Sydney Surry Hills are two fabulous choices. Centennial Park is a perfect spot for taking a walk or just simply relaxing. The Establishment Hotel and Zara Tower - Luxury Suites and Apartments are among the most sought-after hotels to investigate around here. Everyone has holiday horror stories about receptionists from hell and creepy-crawly infestations. But believe us, cheap doesn't have to mean nasty. There's a ton of bargain hotels here, and topping our list are the Big Hostel and Home Backpackers. If you're heading home and you're not a little bit scared to check your bank balance, did you even go on holiday? 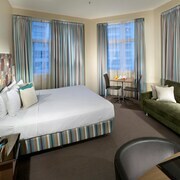 The Rydges Sydney Central and Cambridge Hotel Sydney are worth looking at if you're into throwing down a couple of extra notes. 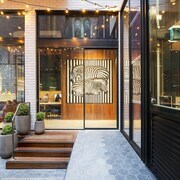 Don't get too cheesed off if you can't snag the best Surry Hills hotel. You'll discover more cool places to crash out nearby. 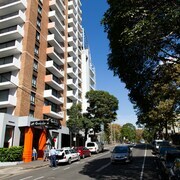 Darlinghurst - Surry Hills is about 0.4 kilometres from Surry Hills, and Crown Street is 0.6 kilometres away. There's nothing quite like stepping off a plane into a new and unfamiliar destination. Hotels, flights, experiences, rental cars — whatever you want, we can make it happen!